Bad Words: Screen Story #23: "Home on the Range"
Somewhere out in the open range of the modern West, two weather-beaten cowboys, SLIM and TEX, are sitting around a campfire at night. Behind them, visible in the firelight, are a horse and a pickup truck. Slim plays his harmonica for a while, then he puts it down and begins to wax poetic, as cowboys often do. He speaks in a slow, deep cowboy drawl. SLIM: "You know, Tex, we've been out on the range for six weeks now, ridin', ropin' and roundin' up cattle, you on your horse and me in my pickup truck. Every night we sleep under the stars, and the immensity of the sky and the beauty of the land make me realize how just much I love you." TEX: "Why Slim, I didn't know you felt this way. You know, I haven't dared say it, but I love you, too." In close-up, we see their hands touch and then intertwine, as corny cowboy music rises. CUT TO: A small Western town in daytime. Slim's pickup truck is parked outside a small church. We hear wedding music. On the back of the pickup is painted "JUST MARRIED" with the usual decorations. Slim and Tex, both in formal attire, get into the pickup and drive off. CUT TO: A beach in Hawaii. Slim and Tex are lying side-by-side in beach chairs facing the ocean. They are obviously on their honeymoon. They exchange loving looks as Hawaiian music is heard. CUT TO: A small Western town. Hand in hand, Slim and Tex enter a mobile home dealership. CUT TO: Outside view of a new mobile home, just installed on an empty lot. Slim and Tex embrace as they gaze upon their new home. CUT TO: A montage. In a series of scenes in and around the mobile home, we see the cowboys' marriage deteriorate. Slim takes to drinking, while Tex is unemployed and refuses to look for work. There are charges and counter-charges. Tex accuses Slim of infidelity, while Slim denies it. Voices are raised, and dishes are thrown. Finally, Slim finds himself locked out of the mobile home, as Tex vows, through a window, that he will be filing for divorce in the morning. TEX: "And I'm getting the pickup!" CUT TO: A courtroom. Tex and his attorney are at the Plaintiff's table, while Slim and his attorney are at the Defendant's table. A female judge on the bench declares: "This marriage is dissolved." 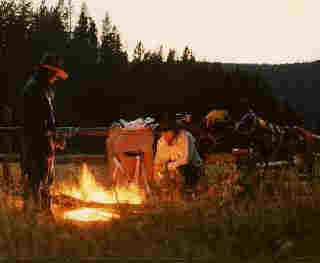 CUT TO: A campfire on the open range. It is a scene similar to the beginning, except that only Slim is sitting there, alone. Behind him is a horse but no pickup truck. Slim plays a sad tune on his harmonica but is overcome with emotion and has to stop. He composes himself, then looks directly at the camera. SLIM: "You know, sometimes a man is best advised to keep his feelin's to himself." He resumes playing his harmonica. Posted from Las Vegas. © Glenn Campbell, PO Box 30303, Las Vegas, NV 89173. Also see my other screen stories at LoveStrangely.com. This story came to me almost subliminally, the same day I shot a campfire scene with a film crew at Tikaboo Peak (photo, album). Another input was the slow cowboy drawl still echoing in my head from the previous story. This one is obviously a parody of Brokeback Mountain, with the paranormal element being that these cowboys live in a world where their love is NOT forbidden. This story is a fictional restatement of the ideas in my “Ban Gay Marriage” flyer. Turns out that many of the conflicts we see as Mars/Venus problems are really just human problems that are going to happen regardless of the gender of the participants. In a sense, the couples who are best off are those whose love is forbidden. Forbidden love is always pure because it never has to be tested in real life.